One of our more popular new products, this vegan mayo is basically magic. If you didn’t know the ingredients, you’d never know it’s not vegan. 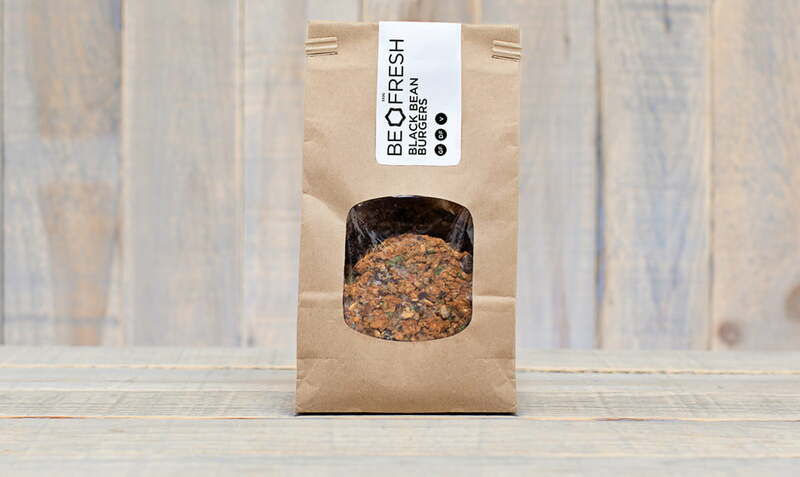 At the Be Fresh kitchen, cookies are a top priority. We cater to most dietary concerns and have plenty of gluten-free and vegan varieties, yet decadent classics too. Choose from dense power cookies to fuel you on the trails or rich Chocolate Chip to enjoy with coffee. Yes, we even have our own line of kombucha! With flavours like Hibiscus Lemonade, Mint Lime and Very Berry, your taste buds will literally tingle with joy. Bonus: a happy belly full of beneficial probiotics! Sometimes it’s tough to get out of bed. But then you think of that warm cup of bubbling perfection brewing away. With notes of fudge and sweet pipe tobacco in our Deep Dark, or jasmine, bergamot and orange blossom in our Light and Bright, our smooth cuppa Joe will start your day off right. Who needs meat when you’ve got a delicious vegan burger? Top with your regular burger fixings and your BBQ will be complete. We get it. You’re pressed for time. You’ve had a long day at work, have to sort out dinner, carve out some you time, maybe exercise, and definitely kick your feet up and relax. Well, we’ve gone and done the annoying work for you. Grab one of these ready to eat meals and you’ll be good to go. We like healthy food, but we also like convenience. Sometimes it’s hard to do both. Enter our salads: if you forgot a lunch again, not to fear. Grab one of these bad boys and it’ll fuel you straight ‘til dinner. Did we mention we make our own muffins? From Morning Glory to Blueberry Oat Bran to Chocolate Zucchini & Cherry, savour any with warm butter on a Sunday morning and you’ll be in pure bliss. Most items available at your nearest Blush Lane store or online at SPUD.ca!